Electronics for Beginners/Dummies: Kill That Fear of Circuits! Electronics for beginners/dummies: Enter the amazing world of electronics: make LEDs-flashing, speaker-buzzing, motor-controlling creations! Here’s everything you need to turn you into an electronics hobbyist. Electronics are amazing. Who’d thought that by merely allowing electrons to flow through various elements such as copper and silicon, decisions are made? 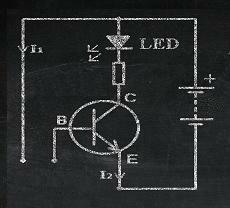 On the lowest level, transistors decide to switch on/off by their base voltage. These decisions extend, through more electronics, to visible results such as your phone ringing, the next MP3 song on shuffle, or the bullet you fired in a computer game hitting its target. It’s fascinating when you think about it like this, isn’t it? 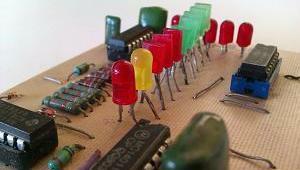 Start Learning Electronics for Beginners! And now you’ve made the decision to get into this level of electronics – so close to the electrons and the elements they flow through that you can almost taste them (well, you can, but don’t go over 9V!). But wait! Here comes that familiar sting – fear. The complexity, the jargon, the math, the cost! 1. Complexity – on my components page you will find just 7 electronic components which is all you need worry about for now, and each one performs a relatively simple task (ok, except for chips – treat them as “black boxes”). I built simple circuits to start with, and then chose more complicated ones with more components as I progressed at my own pace. Take your time! 2. Jargon – every industry has its own terminology, and electronics is no different. I just had to learn a few main words to begin with, including: Voltage, Current, Resistance, and Capacitance – plus their respective units: Volts, Amps, Ohms, and Farads. You should do the same, and take your time – stop and look each one up as you encounter them, and your vocabulary will naturally grow. 3. Math – most people dislike maths because it’s scary. But consider this: what is 7/0.02 ? Of course it’s 350. Well you just calculated the resistor value to use in series with a red LED and a 9V battery. I won’t explain it here but that was using the most important and fundamental law in electronics, Ohms Law (R = V/I). When I was starting out, I only needed a basic understanding of math to get by which included basic algebra for solving equations. 4. Cost – many hobbies can be quite expensive and electronics is certainly one of them. There is a lot to buy, but there are ways to keep the costs down when you’re starting out. Check out my tools page for a short list of basic tools to buy that won’t cost you an arm and a leg. What I did as a beginner to save costs was to use Breadboards for building circuits, which allowed me to reuse components. Education is another cost, but there are good, inexpensive electronics for beginners tutorials to learn from, available to buy online now. How did I overcome those 4 barriers to become a capable electronics hobbyist by the age of about 12? By reading books and magazines about basic electronics for beginners (it was 15 years before the internet! ), and loads of hands-on practical experimentation. That was the best way to learn electronics back then for the home hobbyist, and I’d say that this hasn’t changed. Especially with the internet making so much more information easily available. So if you’re concerned about whether you can grasp this new hobby or not – relax! Take it from someone who’s been there and done that, and understands how you might be feeling. It’s perfectly do-able with the right information and mindset. Since you are reading this, you definitely have the correct mindset at least! As for the right information you need, if the path to becoming a serious electronics hobbyist is A->B->C->D, then this website is good for a grounding in A and an intro to B. For a stronger A->B, you cannot beat the solid focus of a well-written book. I know that the internet contains a huge amount of free information, but there’s just so much of it to wade through, and it’s common for people to get overwhelmed by it all. This then leads to them backing off and losing enthusiasm. A suggestion is the Introduction To Basic Electronics book. Actually, it’s a set of books, videos, and audio files – which is why it has the subtitle “Hands-on Mini Course”. I personally think this set of books and tutorials is perfect for learning electronics for beginners. I would say it is on par with the magazines I learnt from, although don’t expect it to get too advanced. If it has a downfall, it is that it’s directed solely for beginners, and not for people who are already familiar with basic electronics. Probably the best thing about this is that you can virtually TRY BEFORE YOU BUY – if you don’t like it, you can get a FULL REFUND within 60 days of downloading it.